Set Video As The live Wallpaper On iPhone & iPad – Hello guys, today I have something really cool to share with you guys. set a wallpaper photo on the smartphones is too old. And it’s time to do something new so in this article, I will going to show you how you can set any of your videos no matter the length of the video as the live wallpaper on your iPhone. This process is really simple and of course, it doesn’t involve a jailbreak. 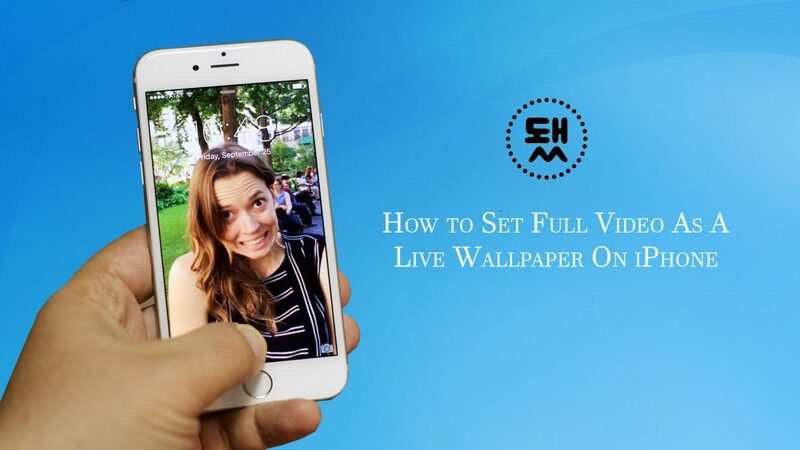 so let’s go further and see how you can set video as the live wallpaper on iPhone & iPad. All you got to do is install this free app (video to live). now there are a few apps that do this and I have told you before an app that does something like this. but they usually restrict the length of the video. Now, you know like live wallpapers they are like three or four seconds and that’s what you can achieve with other apps. with this one, you can set any video of any length as a wallpaper of your iPhone and that’s really really great. So once you install the app and when you open it then it will show you your videos on the home screen. so the app is free and it has a few ads. But, of course, you can also remove them for $1.99 and this app really deserves that it’s because it’s really awesome. so you will see all your videos on the home screen of the app. Just select any video that you want. of course, you can trim that video and you can also go ahead and set the cover photo and once you’ve done then just click on the convert button that you’ll see at the top. So just wait for the video to convert and then you will be able to go ahead and set that video as a live wallpaper on your iPhone with its full length. Once you’ve done then just go ahead and set that video as live wallpaper. So click on the arrow and slide from right to left and set it as a live photo set on the lockscreen and once you go to your lock screen then you will see that you have that video set as wallpaper images and it’s on its full length. so just tap and hold the screen. Guys, this won’t be like 3 or 4 seconds just like the normal live wallpapers. but you can have an entire video as live wallpaper and that’s really awesome to have. Of course, I don’t know if it is really useful or practical. but if you just want to have fun with this then it’s really really awesome. so as I said the app is free and it’s absolutely awesome. It just has a few ads and it doesn’t add any watermark or anything to the wallpapers. so that’s really really great. to download this app, you need to click on the link below and it will take you to the app store from where you can download the app for free. So that’s it for this article guys, thank you guys for reading this article and being with us. hope you enjoy the article and if you like my post then please don’t forget to share it with your friends, family members, and on the social media and also visit daily on this website for reading more new and helpful articles like this one.